This important provision of the ACA was created to end discrimination by insurers against licensed health care providers who provide services within their scope of practice. That includes the community of complementary and integrative healthcare providers across the country represented by IHPC’s Partners for Health. See background, articles and IHPC objectives and current actions in the menu at the left. 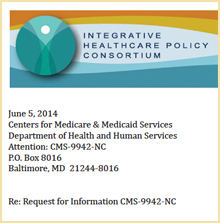 June 5 — IHPC has transmitted a response the Centers for Medicare and Medicare Services (CMS) to the “Request for Information Regarding Provider Non-discrimination” that was initiated in early March by the departments of Health and Human Services, Labor and Treasury. The RFI was issued at the direction of the Senate Appropriations Committee last summer to correct an FAQ the agencies issued in April of 2013 providing guidance on the implementation of Section 2706. The Appropriation Committed said that the guidance had distorted the meaning of the law. IHPC’s response includes the results on an extensive survey of integrative health practitioners who are members of the IHPC Partners as well as other licensed healthcare providers seeking equitable treatment from insurers as Section 2706 requires. More than 5,300 people contributed to the survey, which is summarized in the document. A PDF of the full IHPC response is available here. A PDF of supporting materials for the response is available here. The April briefings for House and Senate staff members was entitled “Easing the US Healthcare Crisis: The Role of Integrative Health Care.” That growing role was described by leaders from The Osher Center for Integrative Medicine at UCSF and the Penny George Institute for Health and Healing at the Allina Health System. IHPC Chairman Len Wiskeski summarized current policy measures designed to expand integrative practice. Read more here. IHPC supports initiatives taken by patients like Stephanie Taylor of California who demand that their states compel insurers to adhere to the ACA and cover the services of providers they prefer. Stephanie and her husband want the April birth of their daughter to be assisted by a licensed midwife. Coverage has been refused by their insurer. UPDATE (March 4, 2014): Kaiser Health News reports on Stephanie’s experience in California, focusing on the continuing uncertainty there about interpretation of the non-discrimination provisions of the ACA. You can support Stephanie’s petition page at change.org here. In a recent note to its members, the American Optometric Association noted that Congress has recently emphasized to HHS, Treasury and Labor to correctly describe the intent of Sect. 2706 in their directives and guidelines to health insurance regulators in the states. In a response to an AANP petition demanding inclusion of NDs in the ACA, the White House said “licensed naturopathic physicians (are)… important to millions of Americans.” AANP CEO Jud Richland explains the importance of this acknowledgment in comments here. The Integrator Blog reports on an AMA campaign to repeal Sect. 2706: “Battle On: MD Specialists Promote Repeal of Non-Discrimination Vs. Integrative Practitioners, Others.” See the article here. Also see IHPC’s letter to congressional committee chairs repudiating an AMA-sponsored bill. Click here for a PDF version.